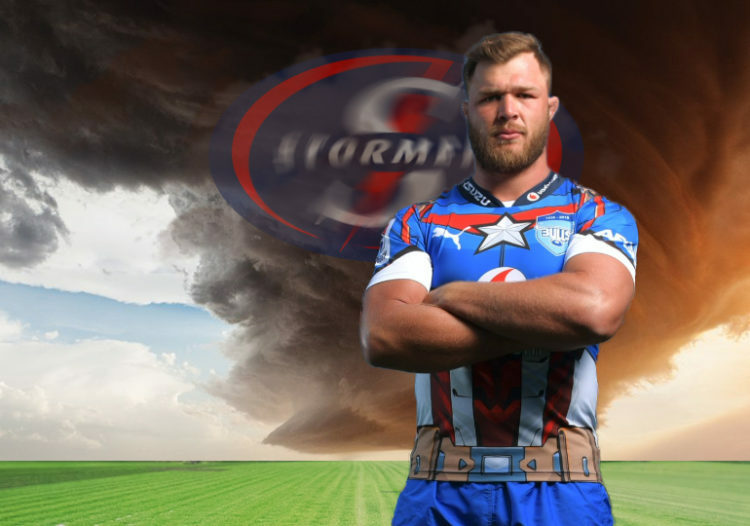 In all the talk about Sunday’s superhero-themed, pre-season double-header clearing the ring-rust and promoting Super Rugby, don’t lose sight of Duane Vermeulen’s first outing against the Stormers. When the Nelspruit Nuke explodes at Cape Town Stadium on Sunday, those caught in the blast radius should address their letters of complaint to Thelo Wakefield. The former WP president lit the fuse when, in Vermeulen’s words, he told the homeward bound Bok thumper that “the Stormers would rather invest in their young players”. Vermeulen, a pillar of the Western Province and Stormers pack between 2009 and 2015 (and now the Bulls’ prize off-season acquisition), has clearly not taken kindly to be treated like a stranger by WP’s infamous decision-makers on his return from Japan. One of the young players the Stormers are invested in is Juarno Augustus. Named the MVP of the 2017 World Rugby U20 Championship, ‘Trokkie’ is viewed by many as the first authentic challenger to Vermeulen’s title as the most physically ferocious No 8 in Stormers history. But nostalgia won’t be among the emotions that get Vermeulen’s heart pounding like a sledgehammer on Sunday when he runs on with the Bulls logo on his chest for the first time against his former team who didn’t think he was worth his paycheck. While it’s an epic event that may have to wait until the season-opener on 16 February, the first showdown between Vermeulen and Siya Kolisi is also close at hand. Kolisi was one of four future Springboks who burst onto the Super Rugby scene for the Stormers in 2012. Together with Eben Etzebeth, Steven Kitshoff and Frans Malherbe, he helped plug the holes in a pack that bid farewell to Francois Louw and Wicus Blaauw in the aftermath of the 2011 semi-final loss in Christchurch, started 2012 without Rynhardt Elstadt (ankle) and then lost captain Schalk Burger to a torn MCL in Round 1 against the Hurricanes. The Stormers went on to win 14 of 16 league matches before bizarrely losing a home semi-final against the travel-weary Sharks. Vermeulen split eight starts between blindside flanker and No 8 that season but missed the semi-final defeat (and the eight matches leading up to it) after suffering a torn PCL while leading the Stormers to victory against the Reds in Brisbane. By Round 16 of the 2013 season, after making his Test debut against Scotland, Kolisi had sufficiently proven his credentials to make his debut as Stormers captain. And in May last year, he became the first black Bok captain. As a rookie in 2012, Kolisi would have been in awe of Vermeulen who was a mainstay in a potent back-row combination with Burger and Louw that had helped restore the Stormers’ contender status by reaching the 2010 final. By the time Vermeulen packed down for the last of 33 starts alongside Kolisi between 2012 and 2015, that respect would have been mutual. Regarded by some as the best No 8 at the 2015 Rugby World Cup, Vermeulen’s reputation waned during the following two seasons as he only made four Test appearances while maximising his earnings at Toulon. In the absence of Warren Whiteley, Vermeulen made seven starts for the Boks last year and he begins 2019 as the incumbent No 8. Four years is a lifetime when you’re 21 and there’s no chance Augustus is going to quietly defer until he’s 25 to make a run at the Webb Ellis Cup. A superhero friendly at an exhibition venue may seem like the wrong context for talking up serious rugby. But in a World Cup year, respect is a priceless commodity. Vermeulen and Augustus won’t hold back in their pursuit of it. It was a bit hard to follow this article to be honest. “But nostalgia won’t be among the emotions that get Vermeulen’s heart pounding like a sledgehammer on Sunday …” and then suddenly you speak about him and Kolisi meeting? Fleckie is resting his Boks, so why even bring that up? Finish your thought, man. Regarding Augustus, I’m definitely interested to see what he has to offer. As for him challenging Duane’s spot, dream on. Duane is more than just a physical player. He has some great ball skills, defense and leadership abilities. What is it with the journo’s writing up the Stormers’ young players like that? The last wunderkind you guys wrote up, Willemse, hasn’t really impressed me in national colours. Maybe give these young guys a few seasons before writing them up for national colours. One back pass in in an entire career does not count for good ball skills. If there is one thing duane does not have is ball skills, if he does he chooses not to use them. Duane would have made a huge difference at The Stormers. They lack rugby EQ which was clear to see last year. They botched numerous winning opportunities through poor execution and poor game management. I don’t think Wakefield had the budget to take on Duane. If this is the case he should have told him the truth. Yes, John I suspect he would have made a difference, but what is concerning is that there is about 12 or so Springboks in their midsts, so it begs the question – should they be Springboks and if the answer is yes, well then why would they play well at National level and not so at home base? They have the National Captain and several senior Springboks, so why no EQ? Is it perhaps not a player issue? Wakefield and co are going to be left with egg on their face after Saturday. Also reading too much into Duane’s feeling about the whole “being treated like a stranger” thing by his former union. He was asked the question, he responded with a truthful answer what he was told, and I’m sure he respects that. Unless he out-rightly stated his “emotions” about the subject, you are just fishing for drama again Zelim.